Back and seats constructed of 2" x 3" recycled plastic Resinwood slats decoratively spaced and preassembled for easy assembly. Six foot benches come with three bases, and eight foot benches include four bases for optimal support. 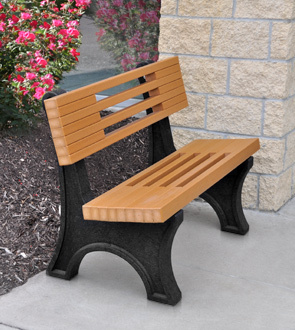 Benches can be mounted into the ground or to the surface for a more permanent installation with mounting kits which can be ordered from the accessories section below. Recycled plastic bases come standard in black. Back and seat available in the colors shown.